Frontier historian Faragher (Daniel Boone, 1992, etc.) sheds new and revealing light on a shameful campaign of 18th-century ethnic cleansing. Apart from Longfellow’s Evangeline and The Band’s song “Acadian Driftwood,” Faragher notes, there seem today to be only scattered folk memories and scholarly considerations of the removal of the French-speaking Acadians from their homeland. The event merits attention, not least because, perhaps more than any other colonial people of the New World, the Acadians acclimated to their surroundings along the Atlantic coast of Canada and became Rousseauvian natural men of a kind that would make Boone envious. 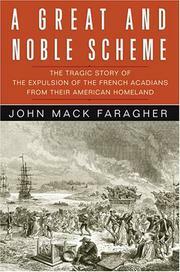 “Intermarrying with the native Míkmaq people of the region,” Faragher writes, “the Acadians forged an ethnic accord that was exceptional in the colonial settlement of early North America.” In part out of deference to their independence-minded native kin and in part to keep out of harm’s way, the Acadians held to a studied neutrality. It did not help; both England and France demanded that they swear allegiance to their respective crowns, a requirement the scorned, illiterate peasants repeatedly evaded throughout the 17th and early 18th centuries. Following fresh hostilities between the warring colonial powers, English officials in Canada hatched a plan in 1745 to remove the Acadians and resettle Nova Scotia with loyal English-speaking Protestants. An enlightened governor failed to put the plan into effect, but on leaving for England for medical treatment he was succeeded by a man all too willing to see the Acadians go. Faragher takes care to name the guiltiest of the bureaucrats and soldiers involved as he describes what happened next: the forced removal, in the autumn of 1755, of nearly 7,000 Acadians, a thousand or more of whom died in transit to other colonies, and the onset of a long guerrilla war that claimed the lives of many British soldiers as well. Altogether superb: an accessible, fluent account that advances scholarship while building a worthy memorial to the victims of two and a half centuries past.